Are my kids safe with babysitter? What is my pet doing while I’m away? Is my home secure while I’m away from home? Now, with KAMTRON Cloud IP Camera. You can watch each room in your house and keep your family safe. 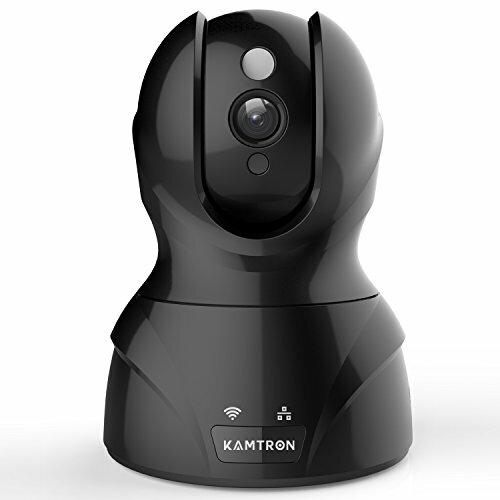 Note: The Kamtron Cloud IP Camera is covered by Kamtron warranty for 12 month from the date of its original purchase. Broad Field of View: Wide 62 Degree Viewing Angle, 350 Degree x 100 degree covers every corner of your home, 1 Super IR LED for Night Vision Up to 20ft, IR cut for capture love images. Supports remotely control the camera rotating to watch every corner indoor with MIPC View App. Easy Set-up: Scan QR Code to download MIPC View App on App Store or Google Play. Seamlessly HD video streaming and two-way audio via your smartphone, tablet, Mac and PC. Wired power outlet required. Supports Ethernet cable connection with router. Motion Detection and Two-way audio: Intelligent motion detection, Two-way voice built-in mic and speaker. App alerts with snapshot&record(SD Card Required) to your mobile device and you can immediately warn the invader with the speaker.